Last week I kept waking up feeling heavy. I’m not referring to the heavy from the unreasonable amount of carbs I indulged in recently. And seriously, it was an unreasonable amount. I have no self-control around a basket of warm, buttery rolls sitting on the table. It’s a problem. What I was feeling was the kind of heavy that I could literally feel in my chest. The kind that makes it hard to get a deep breath. The kind that kept waking me up from my sleep well before it was time for my alarm to sound for the day. I laid in bed, in the dark and attempted to clear my mind. I tried to relax, but the heaviness in my chest was hard to ignore. I was dreading the day and consumed by it. I went to plan B, prayer, which should have been my plan A, but I’m too difficult a person to do things the easy way first. Plan B didn’t really make me feel better either, to be honest. I decided that there was no fix and that I would just do what I do best, ignore it and move on. So that’s what I did. My saving grace is 3:00pm. It’s a time of stillness that comes after my day’s obligations are winding down and just before the kids get out of school and we hit the ground running. From 3:00-3:45 I get the luxury of doing what I want. I usually spend it writing or reading. Sometimes watching reality shows (Naked & Afraid is quality programming). On this particular day I picked up a book and read a few pages. It was the story of Lazarus. He was a guy who lived near Jerusalem back in the bible days. His story was retold in the book of John. He and his two sisters, Mary and Martha, had seen Jesus perform miracles with their own eyes while he was in town. From their own eye witness accounts, they came to believe and have faith in everything Jesus said. So as the story goes, Lazarus became very sick. His sisters watched him as he became sicker and sicker until he was so sick that he was knocking on death’s door. The sisters had 2 choices. They could go with the traditional medical practice of the day to cure their brother. That was a grim pick and probably included leeches or a homemade, bad-tasting herbal potion. People dropped like flies back in the bible days. It was before penicillin was invented so for all I know Lazarus may have been dying from an infected hair follicle or something of the nature. The second option was to notify the miracle man named Jesus, who they knew could heal their brother just by speaking it so. They chose option 2, Jesus. Good move. The thing was that Jesus had left town. This was also during a time scholars refer to as B.I. (before iPhone) so Jesus wasn’t exactly easy to reach. Still, Martha and Mary knew he was their best bet so they sent a message to him that simply said, “Lazarus is ill.” Then they waited for three days for Jesus to come back, which he eventually did. By the time he got there Lazarus was already dead. The sisters took Jesus to their brother’s tomb. Jesus, with a crowd watching, raised Lazarus from the dead and he walked out of the tomb. Fortunately, there were tons of people there who witnessed this event. Their stories all matched up and confirmed that what the bible says happened that day, must have really happened. Thankful for all those eye witness accounts and fact checkers because this story would have been another one that would be hard to believe otherwise. That’s it. Are you kidding me? Lazarus, my brother as you may remember, is sick. I’m really worried if he doesn’t get better soon he may even die. I know you can perform miracles and healing the sick seems to be your favorite so can I ask you to consider coming back and helping him? I know you just left town and it’s so far out of your way, but please come back. I’ll come up with the money to pay for the expenses incurred from turning your donkey back around. Please come back quickly because he doesn’t have much time. He’s getting sicker by the minute. You can find him here at our house when you get back. I drew a map on the back of this note to help you find us easier. Can you give me a sign that you are coming back so I won’t worry? Please help Lazarus. My sister is freaking out too. Please, please hurry. Then to send that and wait 3 days without any word on if Jesus even got the message or not would have made me assume the worst. But Mary and Martha had faith that their “Lazarus is ill” message was sufficient. Their short note implies that they must have trusted he knew better how to handle the situation than they did (gasp!). I wonder if they thought it was wasting sweet time writing more than necessary or maybe they thought it would just be overkill, but whatever the reason was their simple “Lazarus is ill” note had Jesus turning around and coming back to town to help them. It makes me wonder if sometimes I feel like my prayers aren’t favorably answered because Jesus didn’t decide to answer them by following the instructions that I gave with my request. Had Mary and Martha told Jesus following their request that they needed him to come back that very day because they needed his help before their brother died they would have been really disappointed. They would have been at Lazarus’ funeral feeling abandoned by Jesus when all the while he was on his way with full intention of healing their brother. Their simple request/heart’s desire/prayer/message was heard loud and clear from Jesus. He knew exactly the perfect time and how to respond. I bet he even was proud of how much faith it took to write such a short simple message under such dire circumstances. This story suddenly had new and profound meaning to me. I want to be like them. Trusting, confident, full of faith. Keeping things simple. As 3:45pm approached and my quiet time was about to be shifted over to the chaos I call “my life after school lets out” I tried praying like the way Mary and Martha would have done it. I’m worried and feel heavy. And with that I was off to pick up kids from after school activities and to argue with them over the music volume in the car. 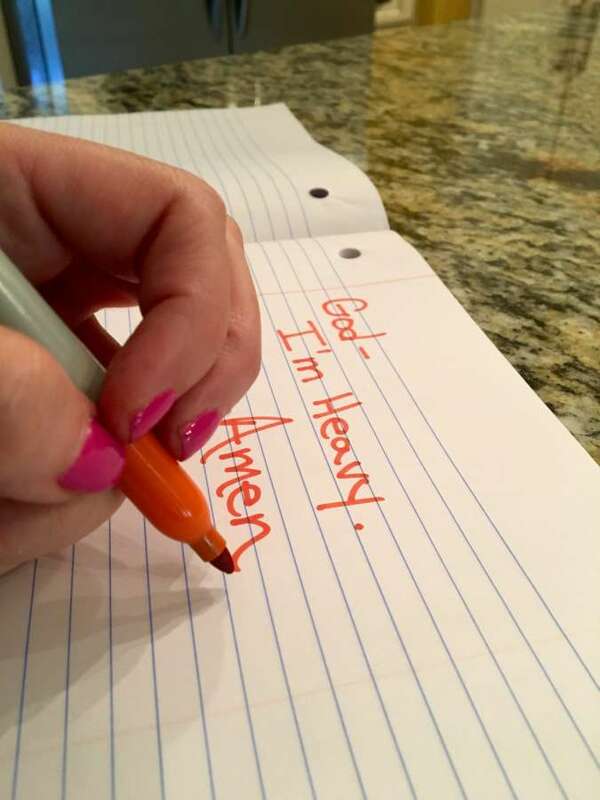 I could sense that my Mary-N-Martha-Prayer had as much significance and was a lot less stressful than my typical pray-with-instructions prayer I usually did. I may be way off base, and sometimes occasionally lots of times I am, but I found last week that I prayed more. 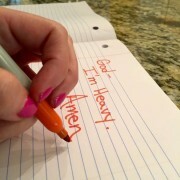 It felt less heavy to pray this new way. Did you hear that? It. Felt. Less. Heavy. Which was my problem to begin with…heaviness. So thanks girls (this is what I call Mary and Martha now…we are tight). Your faith changed me. Thanks for having it. Thanks for including what your message said as part of the story. I would dare to say great minds think alike! It seems as if you read mine or you have been gifted, by God, and He has given you a word of knowledge. That, truly, is the car here. God revealed to you a word of knowledge that you, and most of the rest of us, needed to hear. Thank you, Amanda. I love your blog. I can relate on so many levels. Never doubt the blog… It’s a tool that teaches and reaches many. God bless you! Just what I needed to read this morning! Thank you,Mandy, you’re a true testament to your faith. Bless you and I love you bunches! Lovely Amanda. Just found your blog and I have saved it to my favorites. I’m looking forward to catching up in my free time! Write in sister! Thanks Anne! Honored you enjoy my blog!